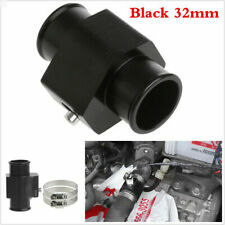 Oil Pressure sensor：1/8 NPT. 1x Oil Pressure sensor. Suitable for Car,Motorcycle or by your need! White 7 Color Series Water Temperature Gauge. Water Temperature Reading from 100 to 300 Degrees Fahrenheit. Electronic Water Temperature Sensor with 1/8th NPT Male Threads. 7 Color LED Through Dial Lighting with Color Recall Ability. The warning light will light when the temperature 114-150 degrees Fahrenheit. 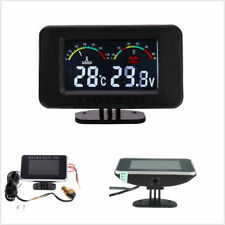 1 X Digital LED Water temp Gauge. 1 X Water temp sensor. Sensor Mounting Thread: NPT1 / 8 ". 1 x Water Temperature Gauge. LED super white display. 1 x Temperature Sensor. Light：7 Color. Add a racing look and feel to your ride,High quality and light weight. Water Temperature Reading from 100 to 300 Degrees Fahrenheit. White 7 Color Series Water Temperature Gauge. Electronic Water Temperature Sensor with 1/8th NPT Male Threads. 7 Color LED Through Dial Lighting with Color Recall Ability. 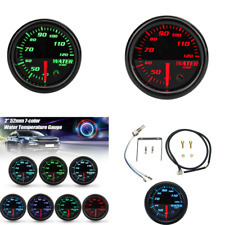 2" (52mm) Water Temperature LED Gauge. Color: Blue LED. Great for Turbo Applications. User must follow the direction given and any misuse of this product is at his/her own risk. Canada and International Countries. A Water Temperature Gauge monitors water circulation temperature in the engine. 2" (52mm) Water Temperature Gauge. NOTE : All of turbo parts and performance may require slight modification in order to fits perfectly. 2" (52mm) Water Temperature Gauge. Reading 100-300 Fahrenheit. A Water Temperature Gauge monitors water circulation temperature in the engine. We can provide minimal support, but we will try our best to help. 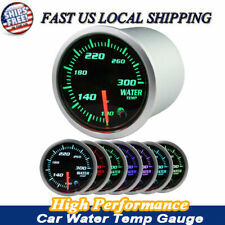 2" (52mm) Water Temperature LED Gauge. Color: Blue LED. Great for Turbo Applications. User must follow the direction given and any misuse of this product is at his/her own risk. Sensor Is Included. Reading 100-300 Fahrenheit. A Water Temperature Gauge monitors water circulation temperature in the engine. 2" (52mm) Water Temperature Gauge. Features LED Lit Back Ground For Even Lights Distribution. 2" (52mm) Water Temperature Gauge. A Water Temperature Gauge monitors water circulation temperature in the engine. Features LED Lit Back Ground For Even Lights Distribution. NOTE : All of turbo parts and performance may require slight modification in order to fits perfectly. 2" (52mm) Water Temperature Gauge. A Water Temperature Gauge monitors water circulation temperature in the engine. Red Illuminated Needle. We can provide minimal support, but we will try our best to help. White 7 Color Series Water Temperature Gauge. Electronic Water Temperature Sensor with 1/8th NPT Male Threads. Water Temperature Reading from 100 to 300 Degrees Fahrenheit. 7 Color LED Through Dial Lighting with Color Recall Ability. Power:DC(10-15V) 12V Professional. Red -- 12V accessory Power. 1 x Water Temperature Gauge. Green -- Boost sensor (connect to green wire from sensor). Orange -- Head light switch (12V switch power). 1 x Temperature Sensor. A Water Temperature Gauge monitors water circulation temperature in the engine. Red Illuminated Needle. 2" (52mm) Water Temperature Gauge. NOTE : All of turbo parts and performance may require slight modification in order to fits perfectly. 1 x Water Temperature Gauge. LED super white display. It`ll just take you 1 minute. 1 x Temperature Sensor. Add a racing look and feel to your ride,High quality and light weight. 2" (52mm) Water Temperature LED Gauge. Color: Blue LED. NOTE : All of turbo parts and performance may require slight modification in order to fits perfectly. We can provide minimal support, but we will try our best to help. 2" (52mm) Water Temperature Gauge. Reading 100-300 Fahrenheit. A Water Temperature Gauge monitors water circulation temperature in the engine. Features LED Lit Back Ground For Even Lights Distribution. 2" (52mm) Water Temperature Gauge. A Water Temperature Gauge monitors water circulation temperature in the engine. Red Illuminated Needle. Canada and International Countries. 2" (52mm) Water Temperature LED Gauge. Color: Blue LED. User must follow the direction given and any m. NOTE : All of turbo parts and performance may require slight modification in order to fits perfectly. 1 x Water Temperature Gauge. Green -- Boost sensor (connect to green wire from sensor). 1 x Temperature Sensor. LED super white display. Wiring Instructions Add a racing look and feel to your ride,High quality and light weight. 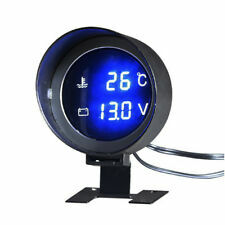 2" 52mm DIGITAL BLUE LED WATER TEMP GAUGE W. WARNING LIGHT. Tire Gauge. Oxygen Sensor. This series is fully electronic with a red digital LED readout, which allows for easy viewing at all angles during any lighting conditions. 1x Water temp Gauge. 1x Water temp sensor. Water temperature alarm: 95 -110¡æ. Suitable for 12V,24V Car universal. Cable length :approx.300cm. 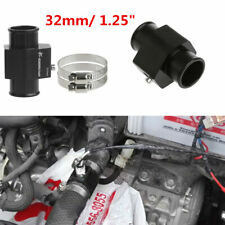 Universal Fits 26MM to 42MM I.D. Hose with 1/8 NPT Threaded Water Temperature Sensor. 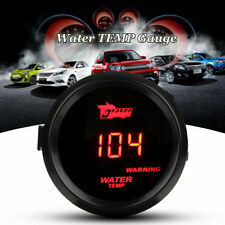 Type: Water temp Gauge Adaptor. 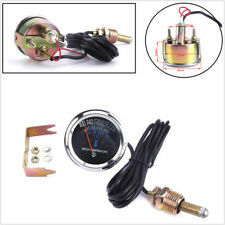 1 x Aluminum radiator water temperature gauge adaptor. Aluminum temperature sensor adaptor. 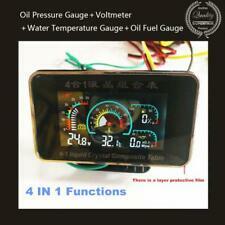 1 X Digital LED Water temp Gauge. 1 X Water temp sensor. The warning light will light when the temperature 114-150 degrees Fahrenheit and the temperature can not be changed ! Power:Professional 12V,IGN MAX 0.3AUnit:℉READ:110-300Sensor Mounting Thread: NPT1 / 8 ". 1 X Water Temp Gauge. The gauge will both show the digital and analog LED. This digital gauge is black with a bright blue LCD reading. Color:Smoked Tint lens when "off",Color LED display when "on". Water Temperature Readi ng from 100 to 300 Degrees Fahrenheit. Water Temperature Reading from100 to 300 Degrees Fahrenheit. 2" (52mm) Black Face Gauge with a Magnified Lens. Green:Temp sensor (blue wire). Ambient temperature: -40 ° ~ 85 °. Electronic digital display, more clear and intuitive. 2" (52mm) Black Face Gauge with a Magnified Lens. Green:Temp sensor (blue wire). 1 x Water Temperature Gauge. Water Temperature Readi ng from 100 to 300 Degrees Fahrenheit. Water Temperature Reading from100 to 300 Degrees Fahrenheit. When the alarm that is displayed flashing alarm. Water temperature alarm: 95 -110℃. 1x Water temp Gauge. Suitable for 12V,24V Car universal. 1x Water temp sensor. Cable length :approx.300cm. Gauge body : 52mm. -The gauge body is 52mm. Gauge Height: 3.2cm. Temperature Range: 100~220 ℉, 38~104℃. Detail Image. 1 Water Temp Gauge. 1 Oil Press Sensor. Water Temperature Gauge: 100-220° F,38-104°. We will try our best to make you satisfy. We will do our best to solve the problem. 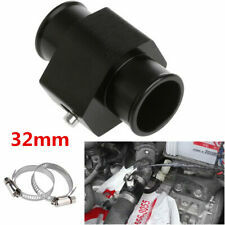 1Pcs Water Temp Temperature Joint Pipe Sensor Gauge Radiator Hose Adapter Car Accessories Size 32mm. Quantity:1 Pcs (32mm). Outside size: 32mm. We will reply you within 24- 48 hours. Sunshield design for better display. 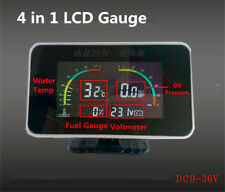 Water temperature display range(-10-120C). water temperature sensor14mm. Universal fit for 12v 24 power car truck etc. 25cm/9.84" 2X Car SUV Seat Seatbelt Safety Belt Extender Extension 2.1cm Buckle. 2" (52mm) Black Face Gauge with a Magnified Lens. Green:Temp sensor (blue wire). Water Temperature Readi ng from 100 to 300 Degrees Fahrenheit. 1 x Water Temperature Gauge. Water Temperature Reading from100 to 300 Degrees Fahrenheit. The gauge body is 52mm. Temperature Range: 100~220 ℉, 38~104℃. We will reply you within 24- 48 hours. Sensor Mounting Thread: NPT 1/ 8 ". The gauge will both show the digital and analog LED. 1 X Water Temp Gauge. This digital gauge is black with a bright blue LCD reading. Color:Smoked Tint lens when "off",Color LED display when "on".